Reviews of great new products scale model railroader, presented by the Narrow Gauge and Short Line Gazette staff. 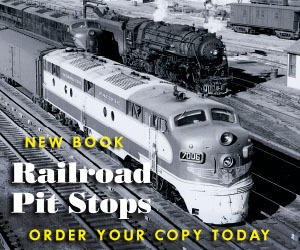 Please contact editor Bob Brown to have your product considered for review. This is another winner from Randy Pepprock, owner of Downtown Deco, and features his superb brickwork and design. 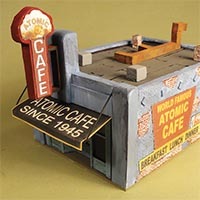 The kit contains plaster walls, and castings for a hanging sign, a Tichy door, Rix storefront, full color signs, roofing, cast plaster sidewalks, and illustrated instructions. New from Bachmann Trains are a ready to run, large scale, 45 mm gauge, Jackson & Sharpe coaches and combines. 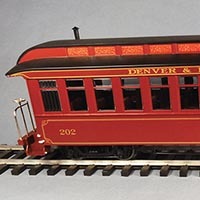 These cars come painted red, lettered for Denver & Rio Grande with gold trim. 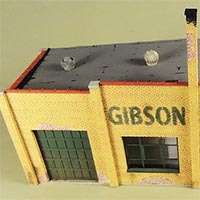 This HO scale model is based on a prototype in Oshkosh, Wis., but is typical of mid-20th century brick buildings in the United States.